For Digital News, October 2004. Carolyn Fairbairn is the BBC's Director of Strategy & Distribution, with responsibility for strategy, new business development and the distribution of BBC services. She is a member of the BBC's Executive Board. Previously, Carolyn was Director of Strategy for BBC Worldwide, devising plans to maximise BBC Worldwide's commercial opportunitioes both in the UK market and in key territories around the world. Before joining the BBC, Carolyn was a member of the Downing Street Policy Unit, with responsibility for policy development in health and social services. She formerly spent seven years working as a management consultant with McKinsey and Company. Carolyn has also worked as a financial journalist on The Economist and as a development economist for the World Bank. Kate: Freeview has been a success in sheer number terms. But, somecriticise the fact that the platform, in terms of the technology of the set-top boxes, is a lowest common denominator one, ie - low cost and low functionality. The majority don't allow upgrades to pay services nor allow true interactivity. So is Freeview really a success? Carolyn Fairbairn: I think that it is a success; now is is right around the four million mark and we're now getting close to BARB numbers. But perhaps more important than that, these are people who have previously been quite resistant to digital, many of whom thought that digital TV was the same as pay-TV. There was a big task to cut through confusion and the evidence is that this has been happening. So it is not just a success in take-up terms but it's a success in terms of changing people's views about the attractiveness of digital and what it can bring them. To take on the criticism that we have been creating a kind of lowest common denominator in the marketplace, I think that is not true. In fact, if you look at the diversity that is out there now there is everything from the � low -end box to some very sophisticated PVR boxes and now you have BT talking about potentially launching a Freeview box that has a DSL connection. What has happened is competition and that has driven prices down and that has been very, very good for consumers. What we are also seeing is a wide variety of boxes for different budgets with different levels of functionality and that is also very good for consumers. Kate: Most, if not all, of the BBC Freeview advertising has talked about the lowest cost, lowest functionality boxes and hasn't mentioned integrated digital TV sets as an option. Carolyn Fairbairn: We have to be clear about what the BBC's role in all of this is. We are not actually promoting any kind of box. That is not our job. Our job is to tell our license fee payers how they can get BBC services. That is what our on-screen trailing is about. So we don't talk about any particulay box and we don't mention a particular manufacturer name. And we never talk about any functionality because as long as the box can receive our services that is in a sense what we are trying to tell people about. So although I understand and I have sympathy with the criticisms of some of the idTV producers and so on, that really isn't our job. That is the job of the retailers and the manufacturers themselves. Carolyn Fairbairn: I would include interactivity as one of our core services. Kate: But the Freeview boxes that are out there in bulk don't have much real interactivity. Kate: The growth trajectory of Freeview has been pretty spectacular. What now needs to be done to keep it growing? Carolyn Fairbairn: The take up, if anything, looks like it is accelerating. There is a very strong word-of-mouth factor. So there is a sort of geometric factor here. I also think that the fact that the channel line-up is now strengthening is very good and we obviously welcome the announcement by ITV about ITV3. These are all things that tip those people who have been thinking about it to move into it. I think we are cautiously optimistic about Freeview growth. Kate: You think it can stay at this 40,000-per-week growth? Carolyn Fairbairn: ... not forever. Kate: But wouldn't that be nice?! Carolyn Fairbairn: Yes, that would be fantastic right up to the remaining 14 million have all gone digital! Kate: Then you could turn off analogue before 2012. Carolyn Fairbairn: Exactly, but gosh, what do I think about Freeview take-up? I think that is has got alot of steam in it yet. A number of analysts out there have drawn the kind of take-up curve of Freeview and compared with DVD and so on. And just looking at the shape of the curve now it looks to be there is further growth but obviously it can't go on forever. In the context of pay-TV, Sky say that it is beginning to slow down. And I think that free digital will be the main growth segment for the next two to three years. And of course Freeview also falls into that perfect present category. So that is why Christmas is always a very good time for Freeview. That � mark makes it the perfect present. Carolyn Fairbairn: I think our policy has sometimes been a bit misinterpreted in this area. We have never been against pay on principle. What we were concerned about, and to a certain extent still remain a bit concerned about, is that the success of Freeview has been the clarity of the proposition. The fact that it is 慺ree� is what has persuaded people to try it. Our concern about Top Up TV is it would muddy the waters and I think it is too early to say whether there is that risk now that the Top Up TV boxes are out there. We welcome the choice. People should have choice. But I think it would be a real step backward if the market overall were to stagnate as Top Up TV gained a few extra homes. Kate: In a sense though, aren抰 your current discussions � and perhaps pending deal with BT � to have a Freeview Plus service that will have a pay element in VOD or other services� This seems set to muddy the waters in the same way as you say Top Up TV does! Carolyn Fairbairn: Let抯 be clear, we have nothing agreed with BT on this. And this is one of the issues. It is very important that when the BBC says to licence payers 搕his is free�, it has to really be free. So we are developing a set of principles which we hope can kind of be 慻eneralisable�, because what we are now aware of is that there are going to be quite a number of different variants of 慺ree-ness�. A free-to-view satellite service is one of them. It has made us really start to think of our relationship with our licence fee payers and what they expect 慺ree� to mean. I agree with you anything that has an immediate hard sell to it won抰 count. In terms of a policy, we抮e working this through at the moment. Kate: Are you developing some policy around what you give in programming and support terms to potential partners like BT, which with their plans for delivering digital broadcast TV and VOD services down their phone lines will be promoting digital take-up? To do this BT will want some, or probably a lot, of your content, so a policy is clearly needed. The second issue is making our content available on demand, on what I think is going to be a very wide variety of platforms that Home Choice trail blazed but which the cable companies are going to be developing their own on-demand strategies and now we have BT with their announcement. I think we are looking at a very exciting area for the BBC. We have seven-day rights for our content funded by the licence fee without a subscription for seven-day catch-up and we would like to make that widely available and we are very interested in talking to partners about how we can do that. Kate: This is the Creative Commons idea of allowing some BBC content to be available for free? Carolyn Fairbairn: The idea is to make BBC content as accessible as we can. What we are thinking about is a one-week window where it is free. Then there is a commercial window, which is where UKTV sits at the moment. And their window would likely be different lengths by genre. And our archive material can then be free again. The BBC Creative Archive is very much the Creative Commons idea of having a really fantastically rich asset that people can use free at the point of use. All of those windows, the catch-up TV window, the pay window and the free archive window we are very keen to talk to people about. Kate: It looks like BSkyB has sort of hijacked the idea of a free satellite service with a subsidised set-top box that will allow users to upgrade easily to Sky抯 pay-TV service. What is the BBC抯 approach now to Freesat as proposed by Sky? Will you partner with their service or go out on your own and launch a rival free satellite service? Carolyn Fairbairn: It is important to go back to what we are trying to achieve because then everything makes much more sense. Twenty-five per cent of households in this country can抰 receive Freeview. They fill my postbag. They fill Mark Thompson抯 [ Director- General of the BBC] postbag. One of the effects of Freeview being so successful is that people mind, even more than they used to, if they can抰 get it. So we are very keen to develop a Freeview on satellite, if you like. With very much the same concept and the same principles and we would like to do that quite quickly. The DTT platform already exists and the satellite platform also already exists so we are looking at how we can be a sort of catalyst to something like free-to-view satellite developing. We generally welcome Sky抯 announcement. We welcomed it at the time and we still welcome it. Ideally, there would be a horizontal market in free-to-view satellite. It does give consumers choice. It does provide competition. And I think we have seen how effectively it can work so one of the things that we are trying to do 梚n addition to be supportive of Sky抯 position � is to encourage the existence of other free-to-view satellite providers. Now that the BBC is unencrypted by basically any satellite box. In fact, you can go down to Tottenham Court Road and buy a free satellite box now. Kate: So, you want to promote these other free satellite offers as the BBC free-to-satellite option, because obviously Sky抯 Freesat option will be a box that has an easy pay upgrade. Carolyn Fairbairn: I don抰 think we would mind in that sense. The important thing is that our services can be received and they will be received on the Sky version. But what we would be concerned about is� if we told our license-fee payers that this is a free way to get BBC services and then they got a heavy sell. We抳e done some research on what audiences expect from the free promise and they don抰 want to be contacted the next day or even a week later or many of them don抰 want to be contacted ever. They feel they have chosen something that is a one-off payment for a box and they don抰 expect to face on-going selling. So it is really about consumer choice. Kate: How far along are you on your discussions about how and with whom the BBC will offer an alternative free satellite service to Sky抯? Carolyn Fairbairn: I think the Freeview model was fantastically successful. It brought in a very wide range of manufacturers and look how it has taken off. Kate: So this will be a BBC -branded and endorsed service where you would ask the manufacturers to offer satellite boxes without a pay upgrade capability? Carolyn Fairbairn: We wouldn抰 ask them to do that! We have never specified if it was upgradable or not. We抳e let the market work that out with Freeview and we would be happy to let the market do that again. Kate: Will there be an alternative free satellite offer endorsed by the BBC that will rival the Sky offer, and hopefully include some other broadcasters as well? Carolyn Fairbairn: Hopefully. I think the model we have in mind is what Freeview has become is a standard. It stands for 30 channels, no subscription, no up-sell. It works. It抯 easy. The other thought is that Freesat would be a standard in this market and would carry many of the same kind of promises. Now one of the issues is whether Sky would be able to fufill that standard. Kate: So the BBC won抰 endorse a Sky free satellite offer unless there is some provision against people being contacted about upgrading to pay? Carolyn Fairbairn: This is one of the issues. Kate: The other problem is with the other PSB broadcasters who are not unencrypted off the satellite. So there will be some hurdles to getting an offer that is non-Sky together with the other broadcasters. How are those discussions going? Carolyn Fairbairn: It is going to be a choice for the other broadcasters. They are very aware of why we unencrypted and so far as we can explain the rationale for what we have done with unencypting our signals we are being helpful. At the end of the day it is their choice. Kate: Do you think you might get some kind of non-Sky free satellite offer up by the end of the year? Carolyn Fairbairn: A number of shareholders. It could easily be set up as some sort of not-for-profit company, possibily limited by guarantee, and with a set of shareholders. Those shareholders should certainly include the PSBs and possibly be confined to the PSBs. I think we still need to think this through. We need to go back to the kernel of the job, which is the transition of the five PSBs into a digital environment. It could be you get the most clarity by having that leadership from the PSBs; and then, with very wide involvement influencing collaboration and teamwork with the manufacturing and retail sectors and also with cable and satellite. Kate: And all those players, from PSBs to manufacturers to pay-TV operators, become shareholders in SwitchCo? Carolyn Fairbairn: No. I think that becomes too unwieldy. That is the thing we are grappling with at the moment. We haven抰 got an answer to it so I am not going to give you one but it essentially how you find a mechanism that makes SwitchCo manageable and I suspect its quite a small number of shareholders but it is nonetheless a collaborative body that is working highly effectively with all the other constituencies. Kate: Do you think that the shareholders of SwitchCo shouldn抰 themselves run it? David Elstein, for example, believes it should be run by a independent professional organisation like an Accenture or Price Waterhouse. Is this the right idea? Carolyn Fairbairn: It could well be an answer. It depends what you mean by 憆unning� and 憃wning� and I think they are very different. I think that unless the PSBs own the process, and by that I mean, they have a very strong stake in it succeeding, it won抰. That said, in some sense it is a kind of virtual company contracting with the best of breed in every single task that needs to get done. I think it抯 probably a good idea and if Accenture were the best outfit for running a mass large-scale conversion that may be a very sensible thing. The other thing I would say is it should operate in the principle of subsidiarity which is if something is best done by a retailer or a manufacturer or a broadcaster or a consumer association or Ofcom it should happen at that level. SwitchCo should only do those things that only it need do. Kate: As part of this the consumer has to be informed about what is happening and so the vested interests of all the players have to be made to serve this greater need. So how should this be achieved, making sure the consumer is protected? Carolyn Fairbairn: I think it has to be the guiding principle behind all of this and in a sense should be written into its articles of association. That抯 what SwitchCo is there for � to protect the consumer through this sort of minefield of a transition from analogue to digital. Kate: We are sort of running against the clock now. So what are the hurdles now to making it happen? Carolyn Fairbairn: The hurdles are being crossed quite rapidly. The ideal is that something is up and running this autumn in some kind of shadow form. I think what it requires is not worry too much about getting all the 憈抯 crossed and the 慽抯 dotted because it can in a sense define itself and one of its first main tasks could be to define itself over the first few months of its operation. The shareholding needs to be decided and I think a chairman needs to be elected. It needs to be independent and perceived as independent by the industry. Those are the key hurdles at this stage, including probably a bit of seed funding but I don抰 think this is going to be a lot of money. I think something could be up and running this autumn. Kate: How far away are we from getting the shareholders and the chairman sorted? Carolyn Fairbairn: We should have some decisions in the next couple of months. I think discussions are happening. Kate: About the cost of all this. You say that the initial seed funding for SwitchCo would be minimal, but certainly switchover itself could cost according to some estimates upwards to �billion. How much will the BBC put in � or should I say the licence fee payers � and how much might come from other sources including perhaps at some point the government? How will the cost of switchover be born? Kate: If you can work out the legal details, the BBC would fund the upgrades of the transmitters for DTT for all PSBs? Carolyn Fairbairn: The danger is if we all do it separately and, let抯 face it we are sharing masts, it is a little bit daft that we may end up duplicating each other. There can be efficiency gains there. Kate: I am conscious of your time here but I wanted to ask you about High Definition TV and the BBC抯 plans. It certainly is something that people are now planning for. What is the BBC抯 view on HD? So far you shoot in HD but you don抰 broadcast in HD. 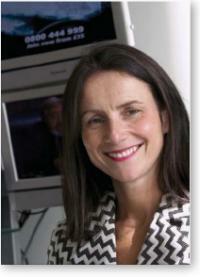 Carolyn Fairbairn: Ideally, in the next few years, we抣l be broadcasting BBC 1 and 2 in HD. That抯 our ambition. And having seen it, as I抦 sure you have, it抯 mind-blowing particularly that you抳e got the plasma screens available. It抯 really taking off. HD is just fantastic. So we are thinking very hard at the moment about how we can up our shooting rate in HD, but also how we can start broadcasting. It takes us into very interesting areas. It抯 very spectrum-hungry, as you know, and we抮e looking at what the potential for HD on DTT could be. It takes us into the area of actually having to re-plan for spectrum. We feel very strongly that the time has come to look again at how spectrum is being planned. If that doesn抰 happen, I think the chance of there ever being any HD on Freeview is very limited. Kate: In terms of spectrum planning, are you talking about compression or finding more spectrum. Carolyn Fairbairn: Compression, yes, but also re-planning of the spectrum to create two more MUXS. Kate: You could do HD channels off satellite. Is that part of your plan? Carolyn Fairbairn: I think we would definitely look at that. Our set policy is to try and use these platforms to the best of its capacity. If we tried to keep everything to lowest common denominator we wouldn抰 be serving our licence fee payers. So we will look at that. HD has shown up a lot more on the radar screen and we抮e hopefully going to be doing a lot more of it. Kate: You抮e right in the middle of charter renewal and there is a thought in the industry � the main proponent of which is David Elstein � is that you will have to make some of the BBC services into pay services at some point and that the thinking is that this will help the transition to digital switchover. Is this something you want to even entertain at this point? Carolyn Fairbairn: It goes right back to what you think the BBC is for. It抯 a deep and fundamental question. We believe in the universal availability of BBC services for free at the point of delivery. This is at the root of public value. It is because everybody can have access to high-quality news and current affairs, original British drama and comedy that the BBC delivers the value that it does. The minute that you made it a subscription public broadcaster, even for BBC 3 and 4, these channels are delivering a specific part of the BBC抯 commitment. So, if you took that out of the universal realm, then you抳e started to really chip away at what the BBC is for. My disagreement with David on this is that our fundamental goal is not to drive digital take-up. Digital take-up is a means to an end, not an end in itself. So the idea that we would put our channels on subscription purely to drive take-up is absolutely the wrong way round. Digital take-up is a means to us serving licence fee payers better.